Within the normal range of everyday fluid flow cavitation is something to be guarded against. Because it occurs when water is put under conditions where, through geometric or working conditions, it is either pulled in tension or shear to create the small cavities of sensibly vacuum that lead to cavitation damage, there are many ways it can be formed. In an earlier post I mentioned the cases where moving water past a blunt-ended surface at high speed can cause the bubbles to form. In an alternate form, this cavitation can be generated when solid bodies are dragged through relatively stationary water at high speed. The most common example of this is with propellers and underwater craft, where the relative flow paths over a moving, submerged body can cause bubbles to form and collapse. When the bubbles collapse, even though individually tiny, they can, because of their number, create a fair amount of noise. That noise, generated behind the spinning blades of a driving propeller, was one way in which submarines could be detected and located during the Second World War. Figure 1. Cavitation forming as water flows around a probe. 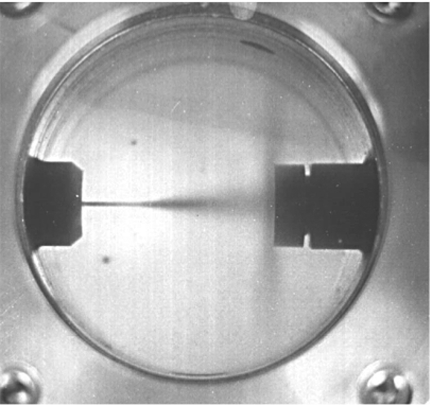 Notice that, in Figure 1, the bubbles form and collapse over the length of the probe, which was, in this case, held stationary while water flowed over the surface within a tube. The relative motion is the same as though the probe, a potential submarine shape, was moving at speed through stationary water. There have been a number of different flow chambers built at different research centers, each in their own way trying to build a device that would allow study of the ways in which cavitation damages surfaces, and to evaluate different materials for cavitation resistance. I have mentioned the ASTM test methods earlier. 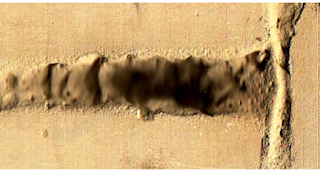 In one such design, (Figure 2) German investigators built a flow channel where the flow channel was narrowed, and then expanded to induce cavitation in the downstream flow. By then placing a test specimen at the point of maximum bubble collapse, a test could then evaluate the different material responses. 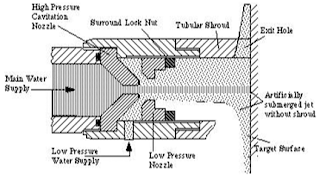 The concept of creating shear, as well as tension in the water around a flowing jet can similarly be imagined where the design above is modified so that the jet that issues into the downstream flow is pressurized to higher velocities. This was the basis for the cavitation cell developed by Andrej Lichtarowicz at the University of Nottingham. This can be applied in a number of ways, in the one below, for example, Canadian investigators had developed a portable version of the concept. Figure 3. Early method for inducing cavitation around a submerged jet. However, it was the Nottingham cell that provided the basis for a move forward in the technology as a number of us, around the world, collaborated with Dr Lichtarowicz in trying the new concept. Early on we noticed that if one listens to the noise made by such a jet, it is possible to hear a change in the pitch of the sound as the relative pressure in the surrounding water changes, relative to that of the driving jet. This relationship is defined by the definition of a value known as the Cavitation Number of the condition. In this equation Pd is the pressure in the downstream fluid, Pv is the vapor pressure of the fluid, and Pu is the driving pressure behind the jet. 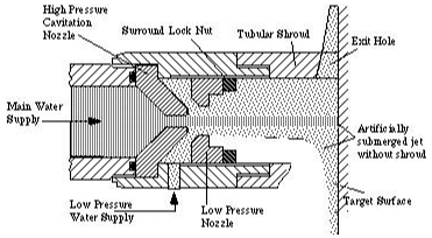 For higher pressure cavitation flows the vapor pressure is sufficiently small that the equation can be simplified to the ratio of the downstream pressure (say 50 psi) divided by the jet pressure (say 10,000 psi) which would give a close approximation to the cavitation number ( 0.005). Dr. Lichtarowcz simplified the design of a cell in which a submerged jet could be directed at a target, with the back pressure in the cell adjusted to control both the intensity of the resulting cavitation, and also its position of maximum damage. This design was of interest to us, since it allowed rock samples to be used and evaluated, and we built and tested several different models based on this design. The two windows allowed the jet and specimen to be lit and viewed during a test. Figure 6. View of a cavitating jet, with the cavitation cloud of bubbles collapsing at the surface of the specimen on the right. Dr. Hood, in Australia, has shown, with high-speed photographs, how changing the back pressure in the chamber changes the effective damage range of the jets. Figure 8. Back-lit photographs of jet and cavitation cloud collapse as the ambient chamber pressure is increased. 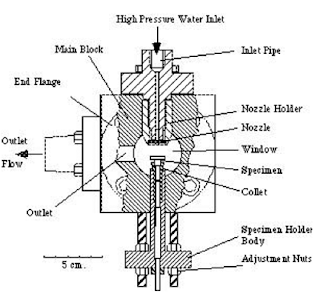 The above pictures show why, in underwater applications, the range of a high-pressure waterjet becomes increasingly restricted as the pressure increases. This is of great importance where, for example, high-pressure jets are being sent to the bottom of an oilwell to clean the filter screens. The range of the jet is controlled, in part, by the jet diameter, as well as the pressure, but can also be expedient to add different chemicals to the flow in order to enhance the range, and I will write on that in a later piece. However, it was through the control of the range, and the intensity of the cavitation that we discovered, in applying the cavitating stream to rock, that the damage was now occurring at a fast enough rate that the small samples, and longer test times of the conventional test were no longer viable. The small samples were being consumed in a very short time, and so the design was modified, so that a target block of rock could be moved under the jet, at a rate of around an inch a minute, while maintaining the cell pressure to intensify the damage. Figure 8. Section of a 2-inch deep hole drilled (at 6,000 psi jet pressure) into a block of dolomite. The damage is caused by cavitation since, at that jet pressure, the fluid would otherwise not damage that particular rock. Note that in this test the sample was not moved relative to the nozzle, and the jet was impacting at the top of the rock, which is to the right end of the hole drilled. Figure 9. 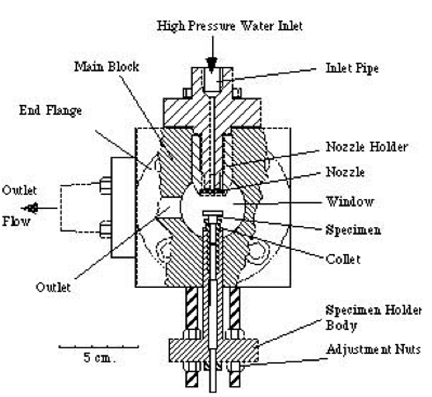 Traversing specimen test cell – schematic view from the top showing the starting position of the jet. The jet is positioned on the end plates until the test starts, and the sample is moved under the jet until the second end plate is reached, when the test is concluded. 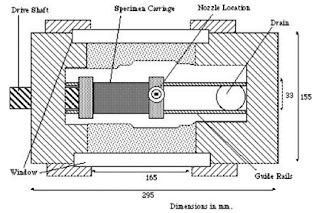 The sample had to be moved at a controlled speed since, as the jet cut down into the rock, so the target surface moved away from the jet, and the depth of focus for maximum cavitation damage is relatively narrow – depending on the test condition. It is in this balance between the effective damage range of the jet, and the intensity of that damage, that is yet to defined in a way that will focus the intensity of damage to its greatest potential. However there are other ways of using that potential, and I will describe those next time.